Just when we thought the controversy over President Obama’s birth certificate was over, it got riled up again by Donald Trump. Now, it seems, even President Obama’s birth certificate can’t stop it. What happened? How did we reach this point? Unless you’re happy with the snowball effect Trump’s created, you’re probably wondering—along with millions of other Americans—how we can break free from it. 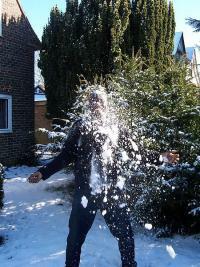 How does one stop a snowball effect … in politics, business, or daily life? Can it be stopped? The snowball effect is a function of complexity. It happens when an issue of minor significance builds up and grows larger. As the minor issue continues to grow, it becomes more and more serious until it snowballs out of control forming a vicious circle of chaos and confusion—a circle created by the parties who encouraged it in the first place. In systems language, the vicious circle created by the snowball effect is a reinforcing loop that tightly wraps around itself and negatively drives behavior in one direction, usually a bad one. That’s why reinforcing loops are so rare, according to the theories of systems thinker Donella H. Meadows. Nobody—and no system—really wants to be caught in an all-consuming pattern of negative behavior that stunts future growth forever. This vicious circle of reinforcing, negative behavior eventually snaps—one way or another—until balance is restored in some way. That’s achieved by reducing the gain of the reinforcing loop or by slowing its growth. The most effective way to stop a snowball effect is to nip it in the bud—to resolve the growing issue before it spirals out of control. You need to understand what’s at the root of the issue and what’s caused it to surface to be able to quell it once and for all. Obama tried to do that this week by releasing his birth certificate, but it was already too late. The issue had already spiraled out of control and had helped Trump gain headlines in the press. There’s one of two ways to resolve this snowball effect: (1) Let the effect run itself into the ground, or (2) slow its growth. To the average American, option two is more viable. Change the channel. Skip the news segments about Trump’s latest conspiracy theories against Obama. Simply tune it out until it goes away. The same advice goes for the media though, as a former newspaper reporter, I can tell you that that’s not going to happen any time soon. Trump’s claims will continue to grab headlines until the story—and the snowball effect that created it—runs aground on its own. Even then, it will probably linger in the media spotlight for its sensationalistic value. As for the future, let’s just say if Trump does decide to run for president and bases his campaign on the creation of new snowball effects for the sake of headlines, the campaign—like any unchecked, negative reinforcing loop—will “ultimately will destroy itself,” as Meadows once wrote.